Just one of the hundreds of Deere customers that contributed over the last few years to the company's new dozer design was veteran crawler operator Rob Anderson. "The 850K's design shows that Deere listened to our suggestions and ideas from the get-go," Anderson said. "We collaborated with the engineers the whole way and they responded to our needs by making the changes we suggested in the cab, in the cooling system. Everywhere. I was extremely proud when I saw the 850K roll off the line. Deere hit a home run and I'm thrilled to have been involved." 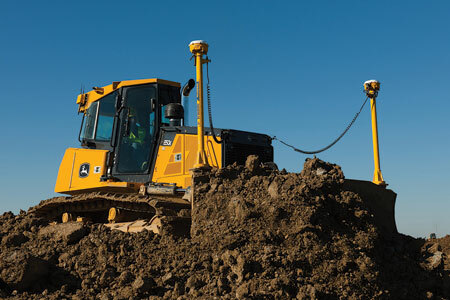 Ideal for earthmoving contractors, road builders and site prep specialists, the 205-hp 850K features the productivity, control and smoothness inherent to a dual-path hydrostatic transmission while the new IT4-certified engine allows customers to meet the latest emissions regulations and bid specifications. In response to customer suggestions for noise-level reduction both inside and outside the cab, the new 850K also features viscous cab mounts that reduce noise to the operator's ear by 45 percent. "When you sit in the machine, close the doors and start it up, you really have to pay attention," Anderson said. "When it's idling, you ask yourself, 'Is it running?' It is! And when you put it to work at full RPMs the noise level is so low that you can carry on a conversation or listen to the radio. Vibration from the cab is nonexistent and that's a huge improvement." "Customers also asked for serviceability improvements to the cooling system, which led to us incorporating our innovative V-cool package," explained Dan Drescher, Deere's crawler product marketing manager. "With a V-cool package fan box that folds down, core clean-out of the cooler is quick and easy from both sides. Customers will spend more time in the cab being productive and less time outside performing maintenance." "I thought that cooling package improvements were a big, big thing for us to ask for," said Anderson. "I wasn't expecting to see improvements to both the radiator and the cooling package." "It's so easy now how the grill folds out. The swing-out doors on both sides are easily removed and there are no bolts to take off. It's great for accessibility to the grill and debris cleaning, and in terms of serviceability, this is huge." The John Deere PowerTech™ 6.8-L IT4 diesel provides either 187 hp or 205 hp at 1,800 rpm, depending on machine configuration, and provides better low-end performance and quicker recovery when operating in the 1,500-1,800-rpm range. The new engine uses cooled EGR technology with exhaust filters, Deere's fuel efficient, field proven and fully integrated solution to meet 2011 EPA emissions regulations. The engine's diesel particulate filters are cleaned automatically during routine operation, which increases overall machine productivity as there is no need to idle down for maintenance. The Deere IT4 engine also offers operation on slopes up to 45 degrees while maintaining adequate oil flow to machine systems. A hydraulically driven cool-on-demand fan operates only as needed, which decreases cab and bystander noise levels, and cuts fuel consumption. Fan reverse functionality also comes standard to blow out debris. John Deere pioneered hydrostatic transmissions in crawler dozers in North America in 1976. Deere's dual-path hydrostatic system automatically matches machine power and speed to load demand, eliminating the need for inefficient gear systems. Full power is available to the tracks while turning with a load – there's no loss of productivity while turning. Inside the cab, customers will find greater comfort thanks to larger access doors and more interior room. Ample glass and well-positioned in-cab components provide best-in-class visibility to the blade. The 850K also features a sealed switch module with keyless start, a 24-volt electrical load center, a standard storage space and a grade control monitor. An air suspension seat is standard. The 850K's new outside dozer (OSD) blade has a three-hole blade pitch with screw-type fine-tune adjustment for infinite settings. Sloped cross-members provide lateral strength and superior visibility to the rear of the blade. Its raised position allows for additional clearance at the end of a push. The Power-Angle-Tilt (PAT) configuration has four positions: forward, forward/mid, back/mid and back. This helps the customer to quickly set desired blade pitch for different applications. Six different 850K configurations are available: the 850K OSD, 850K WT (Wide Track) OSD, 850K LGP (Low Ground Pressure) OSD, 850K LT (Long Track) PAT, 850K WLT PAT, and 850K LGP PAT.